It’s confession time again this morning my friends. And I have a feeling I’m going to be doing a LOT of this moving forward. Why? Because I’ve shifted how I look at things. I’ve completely reframed the way I look at everything I do in my business and it’s been a game changer. Some of you may remember the podcast I did about a year and a half ago with Jon Perez (what up JP!) called ‘Hustle Free’. We started it with a different name (Freedom Papers podcast, long story) and shifted to Hustle Free (I still love that logo). We had a ton of fun doing it and even came up with #FtheHustle. I was committed to my anti-stance on ‘the hustle’. The screaming and yelling online about “DO THE WORK” and “HUSTLE” was doing my head in. I felt like I couldn’t work any harder and was pissed off at anyone who had a message that made me feel like I had to do more. I hit a wall in my business and life and decided I needed to stop doing work I didn’t enjoy (or for that matter, never wanted to do in the first place. Remember, just because you can do something doesn’t mean you should). When I decided to go back to basics, focus on fundamentals and start doing ONLY work I enjoyed… something inside of me clicked (keep in mind this was a process that took about a year). The whole “do the work” and “hustle” thing took on a new meaning to me. I was writing the emails, working through headlines and copy, and consistently publishing. I stopped being a consumer of information and instead became a practitioner. How many people do you know that understand the concepts of an online business and have some decent technical skills yet they never seem to get anywhere? They just keep signing up for courses, planning new opt-ins or products, engaging in new tactics, etc., but it’s like they’re stuck in a roundabout. I’m not saying I didn’t work… I worked my tail off. But it was on the wrong things. Spending 3 hours trying out a new plugin so I could create a post and video, then potentially make an affiliate sale wasn’t a strategy. It was busy work. I made a conscious decision to work on mastery and implementation. 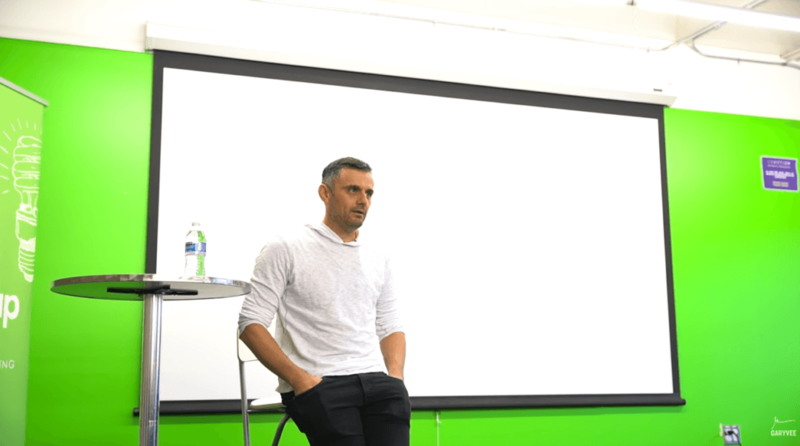 Here’s where the confession comes in… I’ve been bingeing a bit on Gary Vaynerchuck content (I’ve always had a love/hate relationship with him). I have always respected him, but for some goofy reason took the whole ‘hustle’ thing the wrong way. I love listening to his keynotes where he spends 3/4 of his time on Q&A. I completely missed his core message. Which, much to my surprise and delight is really about #JustShowUP. And by the way, I should say that I had the pleasure of meeting Gary in Las Vegas once. 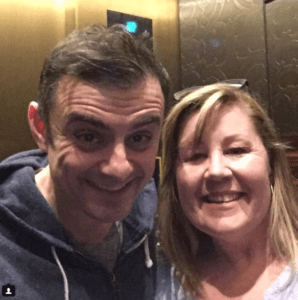 I was there for a mastermind, had gone up to one of the suites to do a testimonial and when I came back down in the elevator & the door opened he was standing there. It was just him & I… and I instantly squeeled “GARY V!” I asked for a selfie then realized I left my phone in the meeting room. He graciously offered to take the picture and emailed it to me instantly. Truly a nice guy. He is a fan of old-fashioned rules, manners, commitment, and obviously, work ethics. He never tells people to work the way he does, but if you don’t want to do the work, quit complaining. He’s also a prolific content creator and preaches about the importance of content. We’ve got less than two months left of 2017. You still have plenty of time to end the year any way you want. Don’t wait for the New Year to start “showing up” in your business. Get a plan in place for how you’re going to finish this year off. Join me this Thursday for a webinar on your “Holiday Content Plan” where we’re going to show you how to CRUSH it with Your Holiday Content and Double Your Sales. (Thursday at [11:00] AM PST, there will be a replay, but you need to register). My daughter actually sold all her Littlest Pet Shop toys to Gary when I caught wind of it that he was searching for them. Great photo of you and Gary. Thanks so much 🙂 That is awesome that your daughter sold her Pet Shop toys to Gary! I LOVE it! I have outsourced most of the tech stuff at this point. My focus is so much more on content and connection (and of course marketing). I’ve also accepted I’d like to hire someone for detail type tasks as well. I’d rather play to my strengths.